Definition at line 48 of file lp-reliability.hpp. Definition at line 52 of file lp-reliability.hpp. Referenced by nfd::face::LpReliability::handleOutgoing(), nfd::face::LpReliability::piggyback(), nfd::face::LpReliability::processIncomingPacket(), and nfd::face::LpReliability::setOptions(). Definition at line 56 of file lp-reliability.hpp. Definition at line 60 of file lp-reliability.hpp. 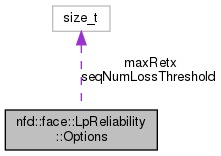 Referenced by nfd::face::LpReliability::LpReliability(), and nfd::face::LpReliability::setOptions(). Definition at line 65 of file lp-reliability.hpp.